We Can Help With every Part Of Built Up Roofing, From The Preparation To Installation. Our structure’s roofing systems are one of the most important functions to the architecture, so it’s imperative that the roof must be long-lasting, cost-effective, and offer a ton of protection to the building. 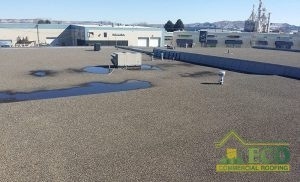 Luckily, there is the built up roof, also known as asphalt and gravel roofs, that have one of the best roof reputations in the roofing industry. Built up roofing has been everywhere since the 1870’s and thereafter, it has offered amazing protection to schools, medical, and different commercial buildings across the world. Security is key if it applies to your office building, and the roofing contractors at ECO Commercial Roofing are here to introduce your structures to built up roof repairs in Texas, Louisiana, and Mississippi that is able to safeguard it from flames, extreme weather, and outside factors that are able to afflict serious damage to your roof. When you’re ready to set up a consultation for built up roofing installation in Texas, Louisiana, and Mississippi, contact the roofing contractors at ECO Commercial Roofing right away. Get in touch by calling (833) 200-0571 for cost-effective and excellent built up roofing installations you are able to trust. Over the course of 140 years in use, built up roofs have gained an unassailable name for dependability. No other commercial roof has a corresponding background to affirm its case for durability. Today, built-up roofs continue to be a widespread choice for commercial structures. This stands as proof of built up roofing’s durability, and its overall resistance to bad weather, fire, high winds, and tears. The quality of its application influences a great deal of a built up roof's advantages. For professional installation in the local community, go with ECO Commercial Roofing. We recognize how to extract the most benefits from built up roofing's levels of felt, tar bonds, and gravel. For each level of felt, your roofing has another layer of water defense, while tar keeps the system together and gravel defends the surface. Facilities around the world, including businesses, schools, and hospitals, continue to believe in the service of built up roofing. For its part, ECO Commercial Roofing installs built up roofs that pass the ordeals of time. To receive the ideal return on your money, count on the masterful labor of our technicians. Our roofers are here to supply clients in the Texas, Louisiana, and Mississippi communities with an enhancement in their roofs with a high-quality built up roofing installation. With years of experience installing and sustaining built up roofing systems on restaurants, hospitals, and other structures, we can deliver you built up roofing that is high-quality, reliable, and durable. The way that we can fulfill this is by hiring roofing contractors that have decades of knowledge assembling built up roofing systems and utilizing state-of-the-art equipment and materials to have your office roof looking and functioning greater than before. Our built up roofs feature assembling and upkeep, to ensure you have a long-lasting roofing system that gives you the ultimate protection. Better built up roof repairs in Texas, Louisiana, and Mississippi will be achieved when you set up a consultation with one of our roofing contractors at (833) 200-0571. A superior roof for your business building is just a telephone call away.